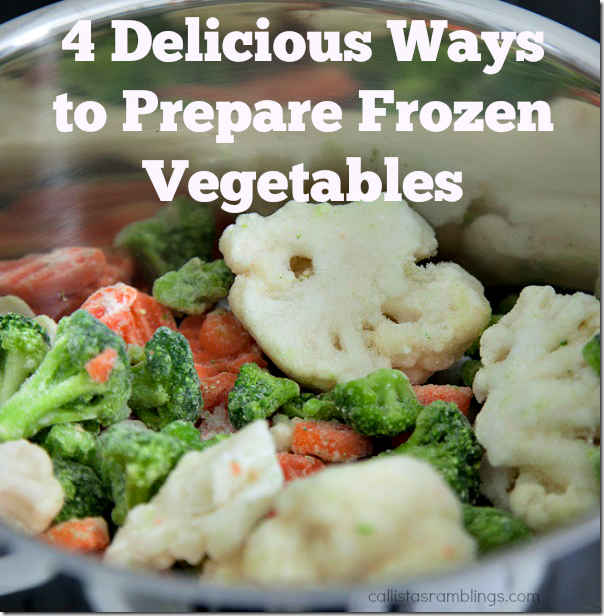 Do you know how to prepare frozen vegetables? There are many different ways but you want to do something to them to make them taste good. That is after all, the point of food isn’t it? Okay nourishment is the main point of food but that doesn’t mean we have to endure tasteless food to be nourished right? Do NOT boil them. All that does is boil the nutrients and taste right out of them. So how DO you prepare frozen vegetables? Fry up some meat in a pan with oil (omit meat or use tofu if vegetarian) and then add in any fresh vegetables you might have first as they take longer to cook. When they are about half done, add your frozen vegetables. Keep stirring and they will defrost and then cook. Yes you can roast frozen vegetables! It’s best to defrost them first. You can run cool water over them or use the microwave. Try to pat them dry of water as best as you can. Toss in oil and sprinkle with salt and pepper or any number of herbs or spices. Don’t crowd them on the pan. Roast at 400F. Keep an eye on them! Use a steamer to properly steam your vegetables. The most common kind goes on the stove but there are microwave versions too. A steamer has water at the bottom and holds the vegetables above it, out of the water. Heat boils the water and the steam rises, cooking the vegetables. When they are fully cooked, toss with butter and your choice of herbs or spices. Defrost them as mentioned above in the Roast section. Pat dry. Place on a piece of tinfoil, add butter and salt and pepper or Mrs. Dash. Fold the tinfoil up and put the two pieces together and then fold it down. Then roll up both ends to create a packet that your veggies can cook in. Turn on one side of your BBQ and start the packet on the hot side. After about 5 minutes, move it to the off side and close the BBQ (or cook the main dish on the BBQ at the same time.) Carefully unroll one end and poke the veggies to see if they are done. Watch out for the steam that will come out.